Bertie George Higgs, the son of a Twickenham undertaker, was born in May 1896. He recalled playing in coffins being constructed and polished at his father's business. 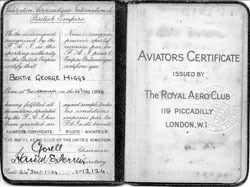 He was educated at Archdeacon Cambridge School, leaving at 13 and joined the Royal Flying Corps at 18 wanting to become a pilot, but was turned down on medical grounds and became a mechanic. While he was working in his father's business during the great flu epidemic of 1918, the demand for coffins was so large that coffin-makers - serving as front-line soldiers - had to be recalled. He became a professional boxer in 1919, reaching the semi-final of the National Sporting Club's Open Featherweight Contest. From 1921, at his father's request, he concentrated on the family business. In 1933, at a cost of £50, he took flying lessons and is believed to be the first flying undertaker. His first "aerial funeral" was in 1935: that of Major Eustace Ainslie, a colleague of Higgs' in World War One, who had been born on the site of Hanworth Airfield. 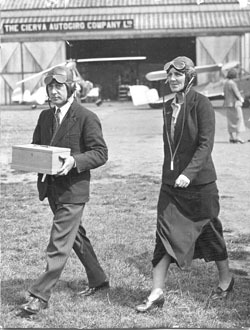 Higgs flew his aircraft over the airfield while the deceased's widow scattered her husband's ashes. He did not attend his father's funeral at Twickenham Cemetery in 1934. However, the local newspaper reported that "during the service at the graveside an aeroplane circled overhead and dipped in salute, and after the mourners had left, the aeroplane returned, dropping three little rosebuds, which were placed upon the grave. They bore the inscription "Dad. Quis separabit?" (who shall separate us?). He retired to Cowfold in Sussex in the 1970s where he died in April 1978. 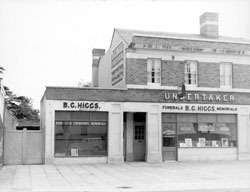 An undertaker, T. H. Sanders and Higgs, still occupies the site of the family business in Heath Road, Twickenham. However, despite its name, it is no longer connected with Bertie Higgs' family. Compiled from a collection of newpaper cuttings, photographs and memorabilia provided by Jean Dudley Hardy, Bertie Higgs' niece.